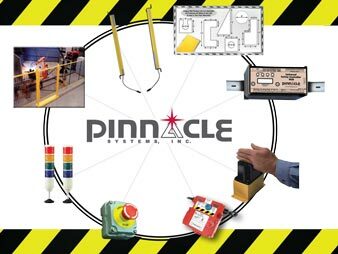 Calculating Safety Distance of Safety Light Curtains | Pinnacle Systems Inc. Formula for calculating safety distance of light curtains from hazardous point of operation. The effective sensing field of the device shall be located at a distance from the nearest recognized hazards such that the operator or others cannot reach the hazard with a hand or other body part before cessation of motion during the hazardous portion of the machine cycle. The point at which a device responds to an intrusion may vary. The devices should be located or adjusted such that the device always responds to the intrusion at or prior to the safety distance. Care should be exercised when installing the device to ensure that it does not detect false signals from other devices in the area. Usually the electro-optical presence-sensing device is used in a manner that provides a protected zone in front of the primary work area with auxiliary devices or guards used to protect secondary access areas. In some cases, however, mirrors may be used in conjunction with the device to provide 2-, 3-, or 4-sided protection. The machine stop time should be measured with the machine running at its fastest speed with its heaviest die or tooling and the stop time being measured at the 90° position in the downstroke. Ds = Minimum safety distance between the device and the nearest point of operation hazard (in inches). K = Hand speed constant. This value has been determined by various studies and, although these studies indicate speeds of 63 in/sec to over 100 in/sec, they are not conclusive determinations. The employer should determine this value by considering all factors, including physical ability of the operator. Ts = Stop time of the machine tool measured by a stop time measurement device. Tc = Response time of the control system (usually is taken care of by the measurement device). Tr = Response time of the presence-sending device and it’s interface, if any, as stated by the manufacturer or measured by the employer. Tbm = Additional time allowed for the brake monitor to compensate for variations in normal stopping time. D(pf) = Depth Penetration Factor. Added distance as indicated by Figure 2. The minimum object sensitivity is stated by the manufacturer. 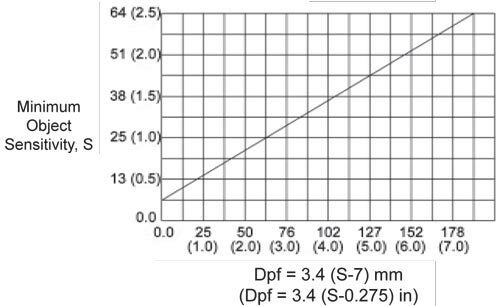 If a Floating Blank is used, use the Dpf numbers found in the Floating Blank section of this manual. Dpf, the distance added to the safety distance due to the penetration factor compensates for varying object sensitivities of electro-optical presence-sensing devices. Object sensitivity = size of the blanked area plus minimum object sensitivity without blanking. Once this value is found, then determine Dpf. If the entire blanked area is filled with mechanical guarding or other fixed material or guards, use the device’s object sensitivity to determine Dpf.